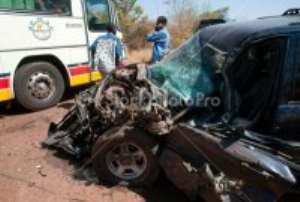 Recent accidents and the higher number of deaths on our roads is a worry to every well-meaning Ghanaian home and abroad. Most of these accidents in my view are avoidable and so I will try to put few of the possible causes of accidents on our roads into two categories namely the human and mechanical factors. Roads under consideration are the WA, BOLGA and TAMALE to Accra roads. I travel with (OA, STC, VIP, and NEOPLAN) busses on these roads since 2012 till now and so this write-up is from personal experience. Apart from STC, I cannot remember any of the aforementioned busses being driven by two drivers for these long distances and it calls for attention. Why on earth should one driver drive a bus from WA, BOLGA, or TAMALE to Accra and back within 24 hours? Due to this situation, the drivers are usually tired and most of them resort to drugs and painkillers to enable them to drive continuously thereby endangering lives on the road. Because of the stress, the drivers go through, some of them doze or even sleep while on the wheel. Others in a haste to get to their destinations so they could rest engage in all sorts of reckless driving including wrongful overtaking. My understanding is that, these busses are passenger busses that carry persons from one destination to another but what do we find in these busses? Goods ranging from flammables to heavy and sharp metallic objects compete with humans for space in the busses even to the extent that some of the drivers will pack goods under seats inside the bus. What should we expect when such a bus is involved in an accident? The design of some of the busses on our roads is very bad. The only entrance to a bus could serve as an exit as well and can only be controlled (opened and closed) by the driver and no one else. So when such a bus is involved in a head-on collision the passenger has nowhere to go than to keep struggling till external help comes or perish. Road network also accounts for a few of the accidents that occur on our roads. Most of the roads are so narrow that they don’t permit the kind of driving the drivers engaged in and so it is actually a problem to those who cannot drive patiently. Parliament and relevant state institutions such as ministry of transport should engage these transportation companies and let them answer questions that bother on human and professionalism on their busses most especially the calibre of drivers recruited, the training the drivers go through after recruitment, why single drivers for this long distances, kinds of materials (luggage) to be included in passenger buses as well as roadworthiness of their vehicles. As a regular user of these busses, if these recommendations are adhered to, I am sure the number of accidents as well as deaths will reduce drastically.